Ammonia pollution from agricultural sources poses larger health costs than previously estimated, according to NASA-funded research. Harvard University researchers Fabien Paulot and Daniel Jacob used computer models including a NASA model of chemical reactions in the atmosphere to better represent how ammonia interacts in the atmosphere to form harmful particulate matter. The improved simulation helped the scientists narrow in on the estimated health costs from air pollution associated with food produced for export -- a growing sector of agriculture and a source of trade surplus. "The 'cost' is an economic concept to measure how much people are willing to pay to avoid a risk," Paulot said. "This is used to quantify the cost for society but also to evaluate the benefits of mitigation." The new research by Paulot and Jacob calculate the health cost associated with the ammonia emissions from agriculture exports to be $36 billion a year -- equal to about half of the revenue generated by those same exports -- or $100 per kilogram of ammonia. The study was published December 2013 in Environmental Science & Technology. The new estimate is about double the current estimate by the U.S. Environmental Protection Agency, which suggests a cost of $47 per kilogram of ammonia. The scientists say the new estimate is on the high end of the spectrum, which reflects the need for more research into characterizing the relationship between agricultural ammonia emissions and the formation of the harmful fine particulate matter -- a relationship that's not as straightforward as previous estimates assumed. 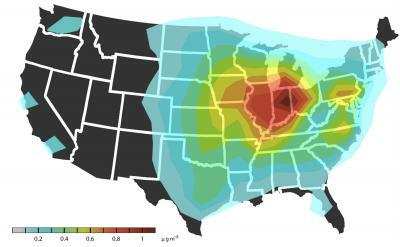 "The effect of ammonia on fine particulate is complex, and we believe that the models previously used in the United States to price ammonia emissions have not captured this well," Paulot said. Manure from livestock and fertilizer for crops release ammonia to the atmosphere. In the air, ammonia mixes with other emissions to form microscopic airborne particles, or particulates. The particulates that pose the greatest health risk are those that measure no more than 2.5 micrometers across, or about 1/30 the width of a human hair, which when inhaled can become lodged deep within the lungs. Long-term exposure has been linked to heart and lung diseases and even death. As such, the particles are on the list of six common air pollutants regulated by EPA's National Ambient Air Quality Standards. An increase in ammonia, however, does not translate to an equal increase in particulates. The relationship depends on meteorology as well as the concentration of other precursors to particulate formation, such as sulfate and nitric acid. To clarify the effect of ammonia on fine particulates, Paulot and Jacob first modeled the agricultural sources of ammonia emissions utilizing a relatively new ammonia emissions inventory. Next they used the NASA GEOS-Chem model of atmospheric composition to simulate the complex chemistry that converts agricultural emissions -- in this case ammonia -- into fine particulate matter. This information was then combined with food export data from the U.S. Department of Agriculture and the United Nations Food and Agriculture Organization, averaged from 2000 to 2009. Results show that U.S. food exports account for 11 percent of the total U.S. emissions of ammonia. "Our study suggests controls on ammonia emissions from agriculture could help reduce particulate matter and provide significant societal benefits," Paulot said. The impact, however, is not equal everywhere. Areas downwind of large agricultural regions often set the stage for more mixing of ammonia with human-made emissions from combustion, such as from traffic and power plants. More mixing means the formation of more fine particulate matter. For this reason, the largest health costs are most often carried by the more populated states in the Northeast and Great Lakes region.